In general, most people see the cord as a bit of a relic once the baby has been born. They view it more of part of the life support system that is no longer needed now that the baby is outside the womb. However, in all reality, the cord has one last job to do. The cord and placenta are in essence an external circulatory system in which one vein transports oxygen and nutrient-rich blood from the placenta to the baby and two arteries transfer carbon dioxide-rich blood and waste away from the baby. Once the child is born, roughly one-third of his or her blood remains in the external part of this system but makes a quick return to the baby via the umbilical cord. That is, unless, the cord is cut before the transfer has been completed. This medical practice became standard in the 1960s as it was thought to reduce the risk of postpartum maternal hemorrhage. However, later research found that it does not impact hemorrhaging or provide any other specific benefit. At any rate, the practice continued. The length of the delay varies depending on the source that you ask. The World Health Organization classifies delayed clamping as when the cord is cut anywhere between one and three minutes after birth. Even so, some medical professionals believe the one-minute mark is too early and recommend the extending the delay to three minutes or more. According to some sources, a delay of even just one minute is a beneficial change as it provides babies that amount of time to transition from life inside the womb to outside. 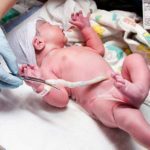 Despite the controversy regarding the exact delay in cutting, there is one thing medical professionals can agree on: Delaying cord clamping is beneficial to the baby. In fact, recent research suggests at least five major benefits of the delay. Just a three-minute delay in clamping the cord can allow one-half of a cup of blood or more to return to the baby’s system. While that may not seem like much, current research suggests that it has significant neurological impacts even years down the road. Children who experienced delayed cord cutting were found to have slightly elevated social skills and fine motor skills compared to their peers who had cords cut within 10 seconds of birth. However, it is important to note that these findings only applied to boys. Iron is one of the essential building blocks of life. Among other things, it is essential for healthy brain development in babies. The natural exchange of blood via delayed clamping provides a significant amount of additional iron to the baby. One study found that a delay of even two minutes increased overall iron stores by 27-47 mg. Whether premature or full term, babies come into this world with roughly one-third of their blood stored in the placenta. This amount is equivalent to that needed to fully supply the baby’s lungs, kidneys and liver. That said, babies whose cords are clamped at the two or three-minute mark have an increased total blood volume and typically experience a smoother cardiopulmonary transition at birth. Delayed clamping may also ensure that the child receives all of the important clotting factors at birth. Delaying clamping by even one or two minutes has an impressive impact on stem cells in the child’s body. These cells play a role in the development of the body’s systems including the immune, respiratory, cardiovascular and central nervous systems. If the cord is clamped immediately, roughly one-third of the baby’s available stem cells remain in the placenta. 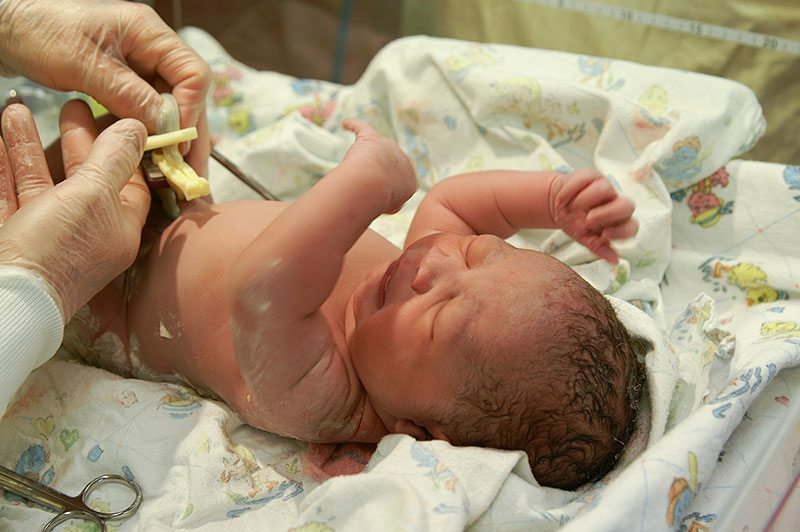 The benefits of delayed clamping extend beyond just full term births. In fact, preemies who have delayed clamping tend to have better outcomes across the board: better blood pressure, less need of drugs, fewer transfusion and less bleeding in the brain. Given the benefits, the American College of Obstetricians and Gynecologists is now recommending a delay in cord clamping of at least 30 to 60 seconds after birth. However, given the recent research on the subject, mothers are free to write an extended clamping delay into their birth plans with a full stamp of approval from the leading medical providers.